If you’ve been following the ongoing warfare within the Bitcoin Cash community (and it is warfare at this point), then you’re probably also aware of the impending Bitcoin ABC hard fork implementation that is set to activate on November 15th, 2018. Approximately one month ago, on October 15th, 2018, nChain, a blockchain technology company headed by Craig Wright, and CoinGeek, released their own Bitcoin Cash software version, called Bitcoin SV (the SV stands for ‘Satoshi’s Vision’). As both entities have noted numerous times, they have absolutely no intentions on allowing the Bitcoin ABC implementation to survive. As a result, they have deactivated replay protection on the protocol in an attempt to cause a ‘blockchain reorganization’ for those that follow the Bitcoin ABC software’s hard fork on November 15th, 2018. Given this information, there are many that are obviously anticipating receiving ‘extra’ coins from this contentious hard fork. This has resulted in numerous exchanges preemptively releasing announcements about their plans to handle the Bitcoin Cash split. The goal of this article is to advise you on the best way to navigate the (potential) impending split on November 15th, 2018. Before you’re able to fully take advantage of this split in the protocol, its necessary to have at least a rudimentary level of knowledge about how hard forks work. There is an amazing guide on the website, lightco.in, that details hard forks and soft forks. For the purposes of this article, we’re going to analyze the potential outcomes for the cryptocurrency when the scheduled hard fork occurs on November 15th, 2018. But before we do so, let’s make sure that we get the basics out of the way first. Your standard Proof of Work blockchain (i.e., Bitcoin, Litecoin, Bitcoin Cash, etc.) has a set of ‘rules’ for the types of blocks that it allows. These rules include various standards such as the types of transactions that are allowed to be mined into a block and the maximum size that the block is allowed to be. Miners do not technically have to follow these rules. They can mine any type of block they want. However, if they want the block to be accepted by the protocol, they must A) provide the Proof of Work [i.e., proof they’ve found the nonce value] B) provide a block that conforms to the rules on the protocol. The entities responsible for enforcing said rules are the nodes. Miners, of course, will be hosting their own nodes more than likely so that they can be aware of when a block has been successfully discovered at the block height that they were working on. There are also individuals on the protocol that are simply running a full node (note: one must be running a full node on Bitcoin to validate blocks). If the block you have submitted contains any identified double-spends or it breaks the rules of the protocol, then the block will not be accepted by the nodes on the network. Given this system, it is truly in a miner’s best interest to adhere to the rules of the protocol or they run a major (and very likely) risk of wasting their time, resources and money because they will not receive a mining reward (Coinbase) if the block is deemed incorrect by the protocol. There are two types of forks that can occur on a protocol (this mainly applies to Proof of Work cryptocurrencies); a hard fork and a soft fork. A hard fork means that there was an expansion in the ruleset (i.e., a larger block size, some sort of extra allowance on behalf of the protocol, etc.). When this occurs, the blocks being created with the new hard fork protocol will not be compatible with the rules of the hard fork protocol because they would technically break them. However, the rules of the old protocol would be compatible with the rules of the new one. So technically, ‘legacy’ blocks (blocks on the chain without the software upgrade) can be accepted on the new upgrade (the hard fork). A common misconception in the crypto community is that a hard fork inherently means there will be a split in the chain. This usually is not the case. What’s important to remember here is that hard forks are simply an expansion in the rule set. So, if the developers (or whoever is creating the software) are able to get a substantial majority of the nodes and miners on the protocol to download the software and begin adhering to the new rule set when the upgrade takes place, then there more than likely will not be a chain split. The above scenario is what is known as a planned hard fork. If you’re skeptical about the frequency of this occurring, we’d like to refer you back to the hard fork that took place on the Bitcoin Cash protocol back in November 2017. This was a planned hard fork to adjust the mining difficulty because of wild fluctuations in block times, making the coin emission schedule varied and unpredictable. 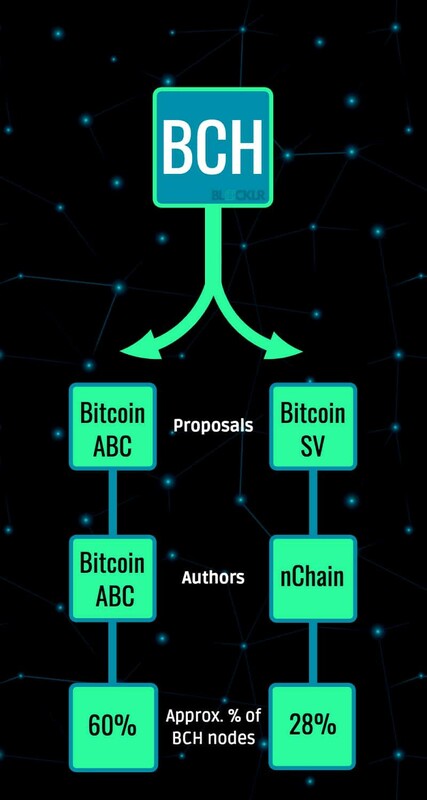 The vast majority of the network decided to download the proposed software upgrade by the Bitcoin ABC team, so there was no chain split. When is There a Split in the Protocol? A) They can create their own version of the protocol with different rules and begin mining blocks on that software version at their discretion. The most famous example of this happening occurred in August 2017 when there was a split in the Bitcoin protocol and Bitcoin Cash was birthed [You can debate privately about which came first or which one is the ‘real’ one; we’re only concerned about software versions in this piece]. B) The ‘dissenters’ can refuse to accept a proposed upgrade on the protocol by refusing to download the new software implementation and instead continuing to mine on the ‘legacy’ chain. The most famous example of this happening can be found in the Ethereum / Ethereum Classic split. As mentioned above, the blockchain-based website, lightco.in has provided an amazing guide to hard forks and soft forks. Within that article are several different scenarios in which a hard fork is proposed on the protocol with numerous different outcomes. Those will be posted below to give a better idea of how and why this occurs. 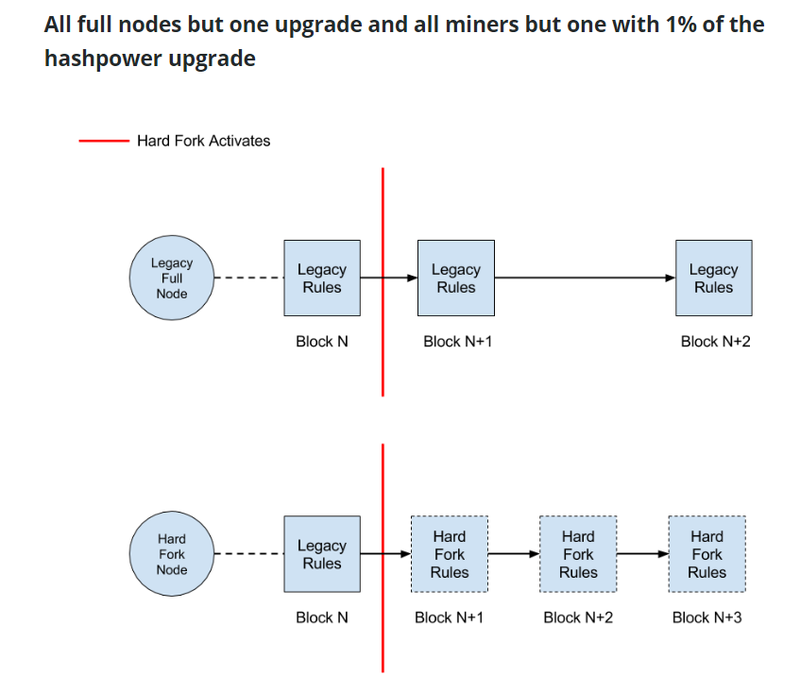 “In this scenario, there is one full node enforcing the legacy rules and one miner with 1% of the hashpower producing blocks that conform to the legacy rules. The rest of the full nodes are enforcing the new hard fork rules and the rest of the miners are mining blocks that conform to the new hard fork rules. 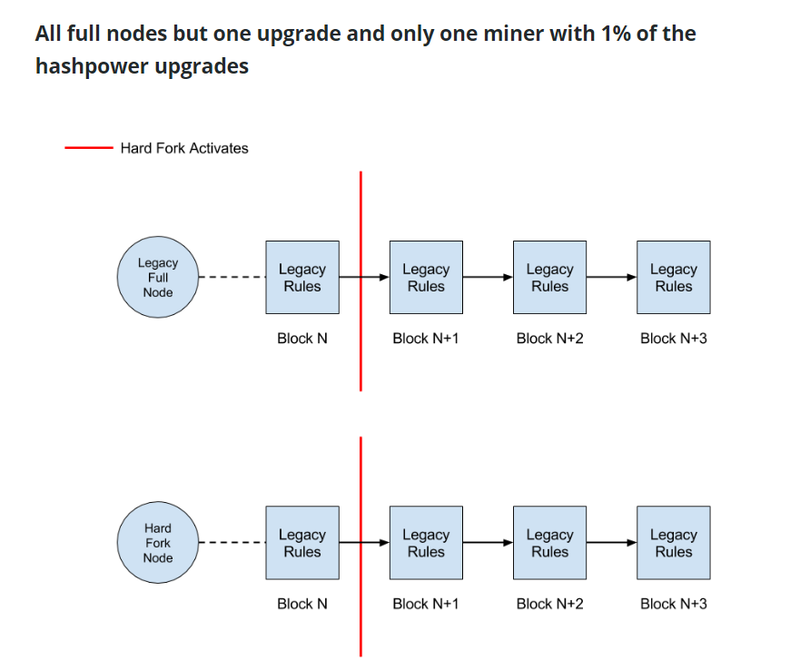 “In this scenario, there is one full node enforcing the legacy rules and one miner with 1% of the hashpower producing blocks that conform to the hard fork rules. 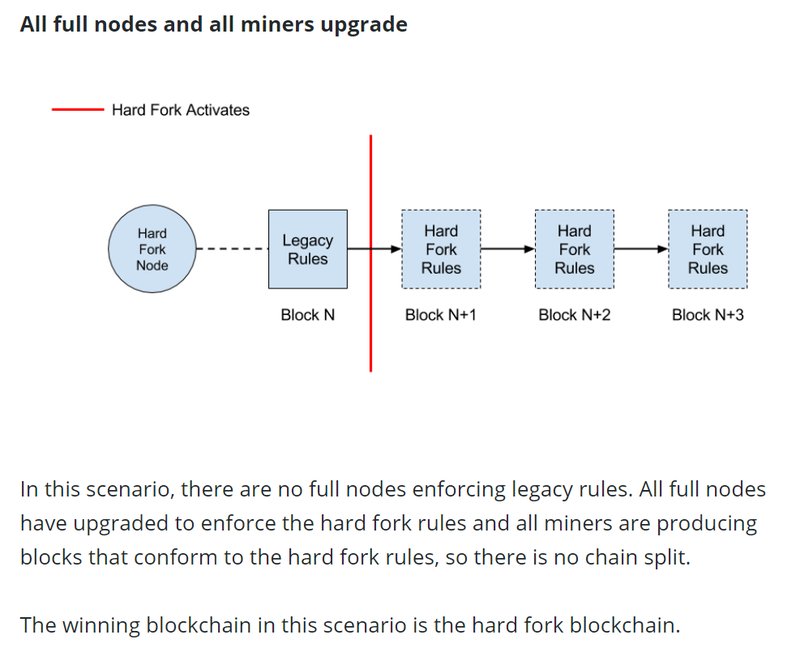 The rest of the full nodes are enforcing the new hard fork rules and the rest of the miners are mining blocks that conform to the legacy rules. The winning blockchain in this scenario is almost certainly the legacy blockchain. 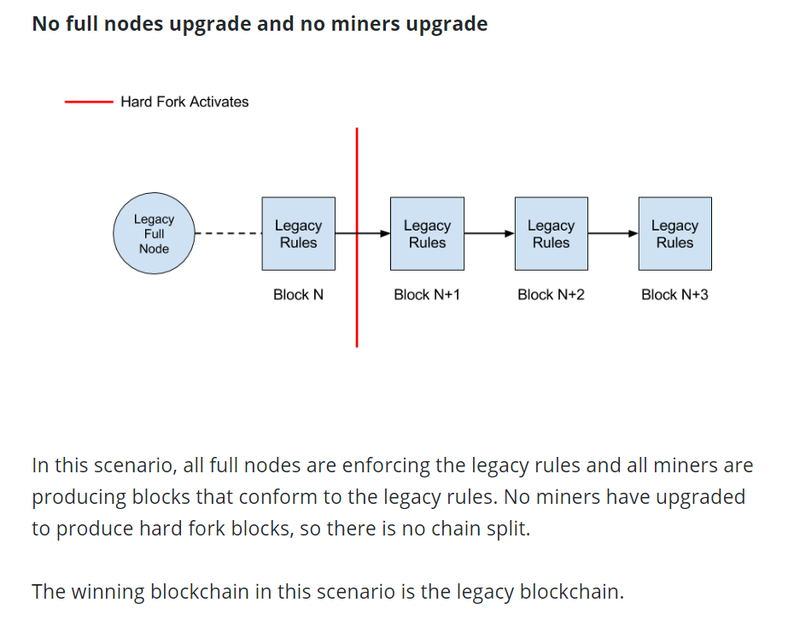 Although identical in network topology, this scenario ends differently than the soft fork version described above because hard fork nodes will not reject legacy blocks. So even though the vast majority of the network is running hard fork full nodes, there is no chain split and no economic pressure on miners to upgrade. 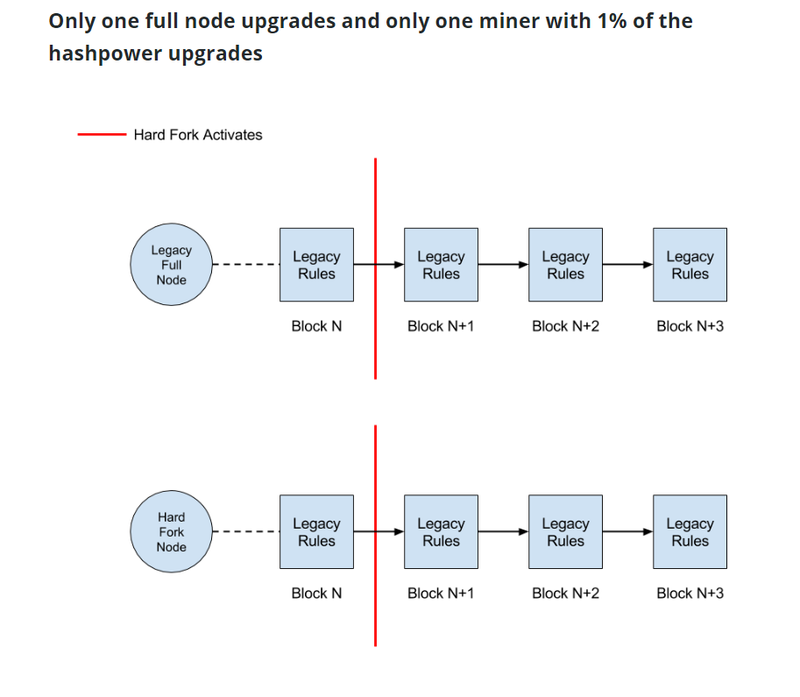 “In this scenario, there is only one full node enforcing the hard fork rules and only one miner with 1% of the hashpower producing blocks that conform to the hard fork rules. The rest of the nodes are enforcing the legacy rules and the rest of the miners are producing legacy blocks. Now that we have a better understanding of what will happen in certain given conditions for the hard fork, let’s take a look at the topology statistics for Bitcoin Cash. Its worth noting that the vast majority of nodes on the network have downloaded the ABC software, which means that they would be accepting only blocks that run the ABC software implementation after the November 15th upgrade is set to activate on the network. However, this may not reflect the true number of individuals that have downloaded this software implementation or any of the other ones that you see listed in the screenshot above. There is a chance that there could be more, less or roughly the same number of individuals after November 15th, 2018. Again, the distribution of hash rate among mining pools could change considerably after the hard fork is activated on November 15th, so take these stats with a grain of salt. The main point of showing you these topology statistics is to help readers gain better insight on what may happen to the Bitcoin Cash protocol after November 15th. The reason why many have characterized the divergence in the community between Bitcoin SV and Bitcoin ABC software implementation as a ‘hashing war’ is due to the fact that Bitcoin SV has removed replay protection from their software implementation. Thus, there is no way to logically calculate whether this is a plausible reality or not. More information should be made available to us in the coming days as it pertains to Bitcoin Cash and the result of this potential split in the protocol. It is possible that there will be some agreement that is brokered directly before the hard fork, or that a clever backup plan will bring itself to the surface in order to mitigate some of the risks inherent with this potential hard fork.